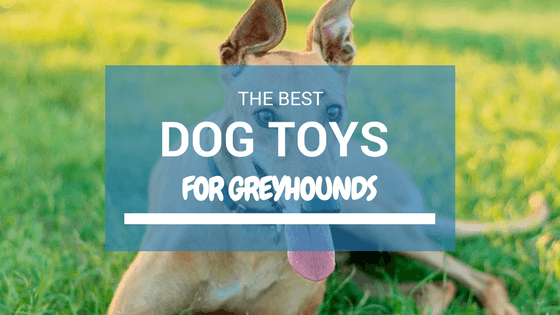 Do you know what your Greyhound's favorite dog toy is? Large sized breeds like the Greyhound need large sized toys to accommodate their size. Big paws and mouths! We recommend you view our selection of suitable dog toys below which varies from durable rubber toys to satisfy their urge to sink their teeth into a chew toy to squeaky toys since all dogs sometimes like to find a sunny spot and just chew or squeak one of their toys. Greyhounds have big personalities that make good companions for active singles and families with older children. Greyhounds are built for speed – many of them can reach running speeds of up to 40 or 45 mph! This breed has been used for ﻿﻿﻿﻿﻿﻿racing, lure coursing, and open field coursing for a long time so they are known to be very athletic and energetic. Greyhounds are a quiet, timid breed that enjoys a quieter household. Greyhounds make great cuddle buddies and are known for being sensitive and well-mannered. Greyhounds can do well in urban areas and in some larger apartments, but owners need to give them daily exercise and stimulation to keep them happy. If you're a brand new owner of a Greyhound pup, then check out this quick video to learn more about them. How Do Greyhounds Like To Play? 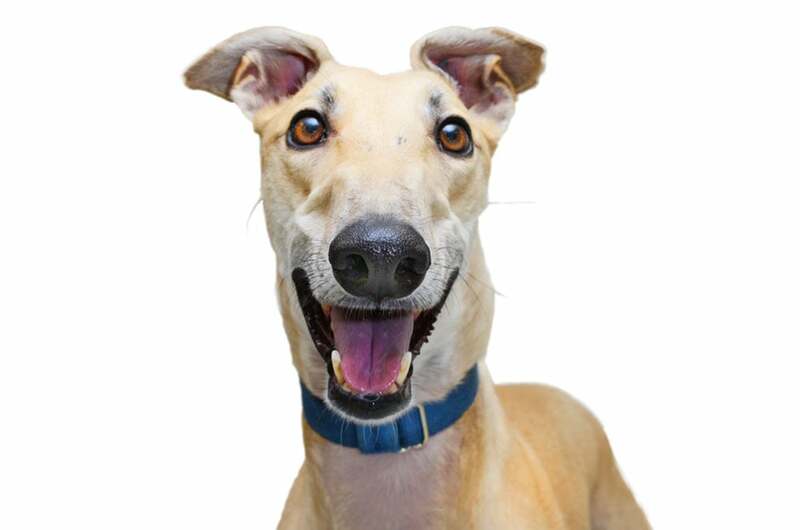 It is recommended that owners walk their Greyhound at least once per day, but other play and exercise is also necessary to meet the energy needs of this large breed of dog. The Greyhound was bred for speed and sight, so taking Greyhounds to the agility track or somewhere with space for them to sprint is ideal. Since Greyhounds have also been used as hunting companions in the past, they do enjoy going after game like rabbits or foxes. Since they love to chase small animals, Greyhounds should always be leashed while playing or within an area with a high fence and secured gate. Instead of allowing a Greyhound to chase small prey, owners can focus on buying them toys that mimic their prey (like toys that move or plush animals) to help nurture those hunting instincts. Greyhounds can sometimes be known as couch potatoes, content to sit around the house after a good run or long walk. One good way to mentally stimulate a Greyhound while walking them is to take them to different places and play hide and seek with toys or people. Tell them to wait while you hide the target, and then give them the go ahead to find it! This can be a great way to feed a Greyhound’s instinct to hunt for things without letting them run loose and hunt other animals. Another way to engage a Greyhound’s instincts is to take them to an agility track or (if you have the yard space) come up with your own type of agility track with obstacles that your Greyhound can work on. Bright dogs with strong, fast legs and a need to please their owners love the agility track. By entering their Greyhounds in competitions, owners also get to socialize their pets while they give them a great form of exercise! Since this breed is eager to please, training them is relatively easy. Greyhounds just have a little bit of an independent spirit, but with patience and positive reinforcement they can be very obedient. 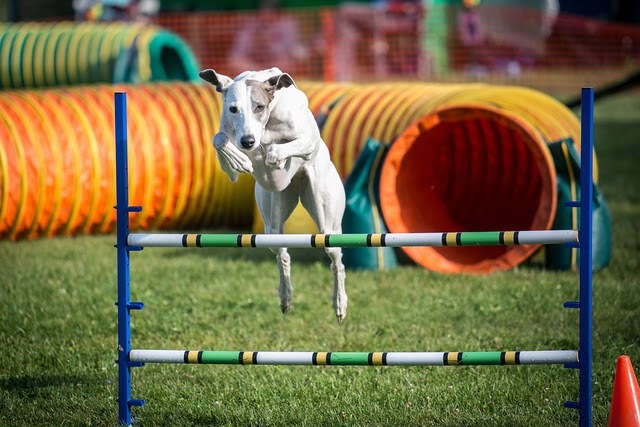 Check out the AKC agility events for your Greyhound! 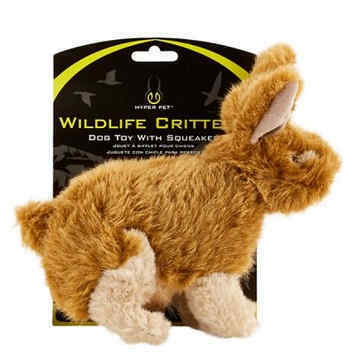 Stuffed rabbits, squirrels, and ducks are extremely popular with Greyhounds who will look at these toys as their prey. The Petlou Rabbit (15") is an example of a toy that has been used and recommended by owners with s﻿﻿igh﻿﻿﻿﻿thound breeds like the Greyhound. 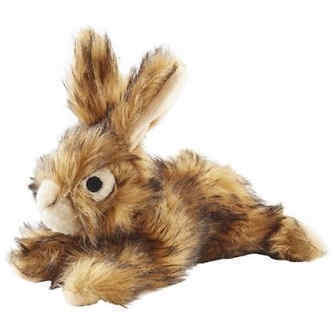 This realistic bunny toy is a great buy, inexpensive and long lasting. When it comes to the Greyhound, opt for the larger size. This soft plush yet sturdy dog toy is highly recommended! Considering you can get this for just 10 bucks – it’s a bargain. Just about any dog loves a soft squeaky toy, but very few of them can withstand the determination of a large breed dog who wants to get to the heart of the toy – the squeaker. Many pet owners can attest to the fact that they have bought more of these toys than they can count, only to have them ripped to shreds in a matter of hours. One toy known for withstanding the Greyhound’s strength is Hyper Pet Wildlife Critter Dog Toy, a realistic plush and squeaking toy great designed to be extra tough. This toys exceeds child toy safety standards, so rest assured about giving this to your dog or puppy. These Wildlife Critters are available in other various fun animal shapes: Chipmunk. Hedgehog, Mallard Duck and a Raccoon. If your Greyhound pup is into squeakers and crinkling noises, we strongly recommend you check it out this toy for some serious indoor play sessions. 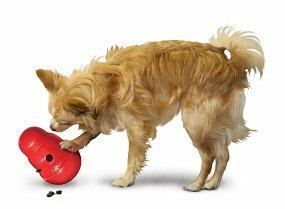 Food-dispensing or interactive chew dog toys like the Kong Classic Wobbler is great for getting Greyhounds excited and motivated to get the food out of their toy all the while keeping them challenged! Stuff the Kong with a variety of tasty treats! 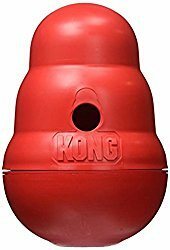 The Kong is well-known for being durable and easy to clean, making it a no-brainer for any dog owner. These types of toys are a great way to keep your dog busy while you are working or away or to slow down their eating. It unscrews for easy filling and cleaning (Dishwasher safe) and is made of FDA food-approved, high-strength, plastic polymer. The best thing owners can do is find ways to keep their pets stimulated when they are alone to stop them from acting destructive if they get bored easily or suffer with separation anxiety when left alone. It's also pretty sturdy and long-lasting, if your pal is a chewer or has sharp teeth. This toy is a must in your arsenal, recommended by vets and pet parents worldwide as the best dog toy on the market. Don’t think that you can buy just any squeaker toy for your Greyhound and expect it to last. Greyhounds are large dogs with a lot of strength and a hunting instinct that makes them dig into their prey. Soft plush toys may not last long with a Greyhound that is aggressive towards them, so quality is important when picking them out. Dog toys that are stuffed with foam can be toxic to pets if they eat it. Since Greyhounds are likely to rip apart soft toys after a while, these should be avoided. One alternative is to look for brands who don’t stuff their soft toys. Greyhounds are great companions that love going for walks and playing with toys that bring out the hunter in them. To manage a Greyhound’s energy, owners should give them space to sprint and potentially get into agility with their pet as a past-time. An active lifestyle along with a healthy diet will keep a Greyhound happy and healthy for a long time, which is what any loving pet owner hopes for.